BACK in early September 2013 I was looking for a new Enduro bike. There are plenty to choose from and the choice can be a bit confusing at times. The best bet is to be honest with your ability, whether you are new to the game or not as young as you used to be. 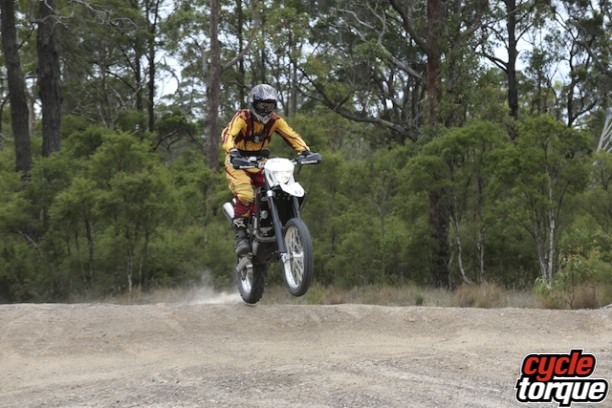 Something like the Suzuki DR-Z400 is a great choice for trail riding, designed with its larger oil capacity and low maintenance schedule for a really good performance package on a great budget. But my mind really started to lust for the high performance lightweight machines that I knew were going to set me back $12000 or more once on the road. 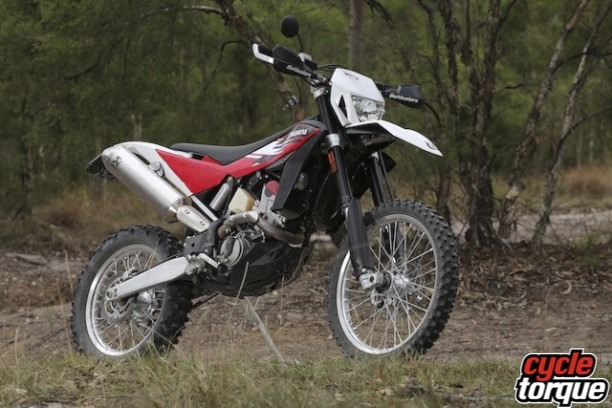 Decisions, decisions – I had pretty much decided a KTM 350 EXC was for me but as a last look I called past my local Husky dealer to see that Husqvarna was moving all the remaining 2013 stock for an unbelievable price. Sitting on the showroom floor was a brand new TE 449 ready with NSW rego for an unbelievable $8,930. To add to that it came with an Akrapovic slip-on and programmed with the race-II mapping on the CPU. I nearly fell over racing out the door to get the cash. The Euro thumper made its way to my garage late on a Friday and was out on the trails early Saturday morning with a few of the boys for my first impressions. I’ve had the bike for a couple of months and 650 kilometres now and even though I haven’t been riding it as much as I would like due to the summer heat and other life and family commitments, I have put together some of my thoughts on the bike so far. Now, some blinkers are better than others but the standard units are not very flexible examples and will snap off the first time you give them a good brush up against anything such as vines or saplings so it’s a good idea to take these ones off before they break off like mine did. I took off the bulky standard rear number plate mount with the tail light and replaced it with a compact LED unit for about $50. It’s tidy, functional and much cheaper to replace than the original. The digital readout is functional and compact but when riding and taking a glance at the readout it is almost completely blocked out by the throttle cables making it almost useless when you are on the move to check your speed or times. Tilting the handlebars forward only made this worse but it improved comfort at the controls for me. Fitting the Barkbusters provided great protection for my hands and controls but then the front brake hose also joined in on the fun over the speedo. I have made an attempt to re-route the cables with little improvement so far but I will have another more serious attempt soon. 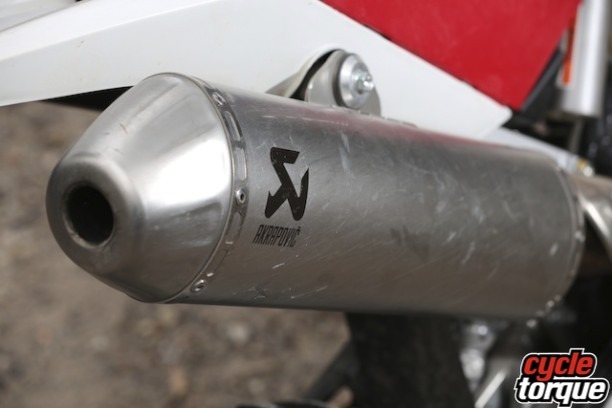 The fuel efficient electronically injected 449.6cc engine with its 98mm bore and 59.6mm stroke is a competitive powerhouse when combined with the Akrapovic and Race II mapping which are part of the package. The 8.5 litre fuel capacity provides a useful range through an unconventional 6.5 litre black fuel tank under the seat feeding a clear 2 litre sub-tank on the engine. For those looking for a longer time between drinks there are also auxiliary tanks available aftermarket which feed the main tank if you feel you need it. The engine provides plenty of torque through a six speed gearbox and clutch which is light and easy to feather with one or two fingers for smooth controllable power delivery to the rear 140 x 80 x 18 Michelin. Having the fuel tank under the seat to redistribute weight means the air box has to go above the engine. This also smooths out the top deck allowing the seat to go all the way to the headstock. To service the air filter you have to remove the seat with a finger operated cam-lock, and then remove five small bolts with an 8mm spanner, then remove the side-cover before you can release the two clips and slide out the foam air filter. It’s too fiddly and time consuming for a modern enduro race bike in my mind I am sure with a little more thought the engineers could have designed better tool-free access to the filter for faster changes in maintenance periods. The gear change lever has a reputation for coming loose as mine has so check it regularly and tighten it up or it will strip out at the most inconvenient time. Being a very odd shape with the spline shaft behind the drive sprocket means getting anything on it to replace a stripped lever to get home will be very difficult. Husky’s unconventional approach of the Coaxial Traction System (CTS) is a hand-me-down developed from the BMW G450X grafted into this package. It places the countershaft sprocket on the swingarm pivot point allowing tighter chain tension and more constant drive to the rear wheel improving traction through the suspension range. I have found it works very well, giving the bike lots of drive and a bit of a unique feel, however it does complicate countershaft sprocket changes which I haven’t attempted yet. I have found the fully adjustable suspension and the handling to be as impressive out of the box as the engine. The brakes have excellent feel and control with plenty of stopping power. It has all the lightweight quality goodies and the whole bike as a package has impressed me providing a competitive performance and handling package that looks and sounds great. No bike is perfect for all conditions and riding styles. Different riders have different skills and opinions, likes and dislikes. High performance machines always require frequent maintenance and fine tuning so I was ready for that. The whole bike has been designed around form and function and pushing boundaries which has the unfortunate side effect of slightly more complicated or clumsy maintenance procedures such as the countershaft sprocket and air filter changes. 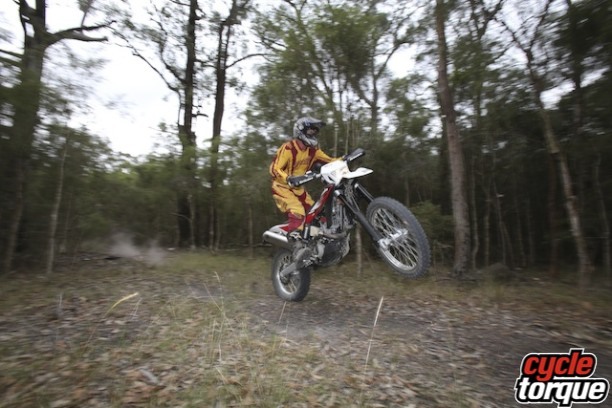 This will have little effect for a trail rider and day racers but it may cause some slight time issues on a 4-day enduro style race event with limited maintenance times. So far the bike has held up its side of the bargain. My fitness and skill level leaves a little to be desired these days but my TE 449 gets both thumbs up from me. It is the final development of this model and I haven’t had or heard of any serious issues indicative to these bikes. It’s a fast and competitive high performance machine bought at a give-away price and the end of an era for the Swedish/ Italian/ German conglomeration. For better or worse this bike will be remembered for its ideas and design as the brand merges back to the future with Husaberg and its Swedish origins into a more conventional design brief for 2014. Despite the 449’s few minor irritations it offers so much for so little and I couldn’t be happier with it.